My family and I are huge fans of traveling. Last year took an RV road trip from Indiana to Utah and had so much fun. This year, we drove a much smaller distance and took a road trip from Salt Lake City to Boise and had a great time! This Road Trip Travel Snack Box is a traveling life saver. 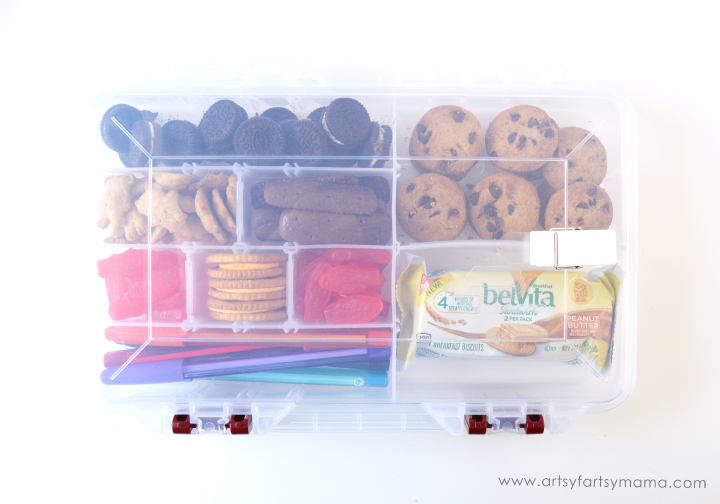 It doubles as an activity tray AND as an organized snack container! 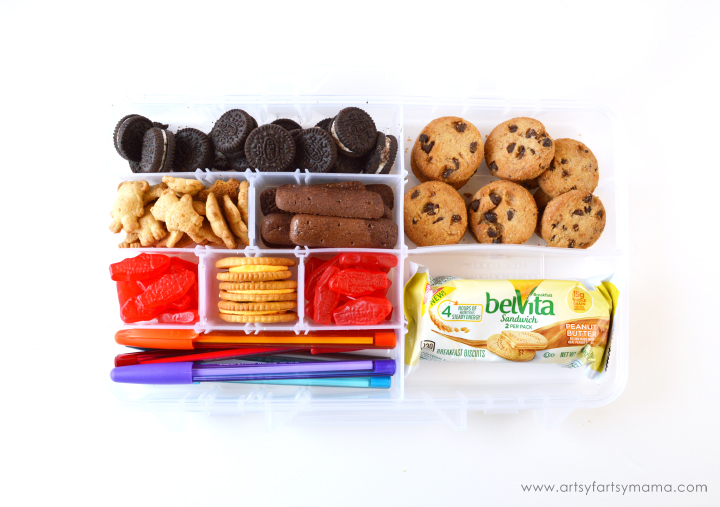 The first thing you'll need for a travel snack box is, well, a box of some kind! I highly recommend finding a plastic container with different compartments. You can find all kinds of different shapes and sizes. This particular container was found near the fishing supplies. I have also seen some great ones in the craft section. 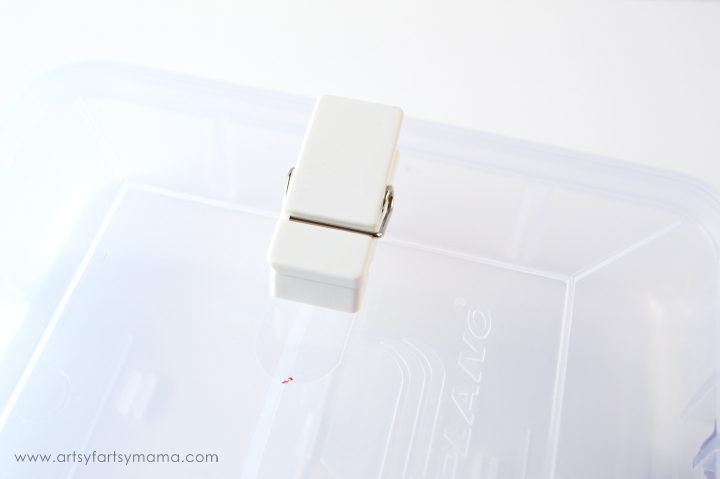 You will also need some kind of clip to attach to the top of the container (you'll see why later). The easiest and quickest option I found is using a Command Strip clothespin! The Command Strips are easy to use. Press the sticky backing to the container first. Then, stick the clothespin to the backing and press it for 30 seconds. The clips hold wonderfully. If for some reason you decide that you don't need the clip at a later time, it comes right off without messing up the container! 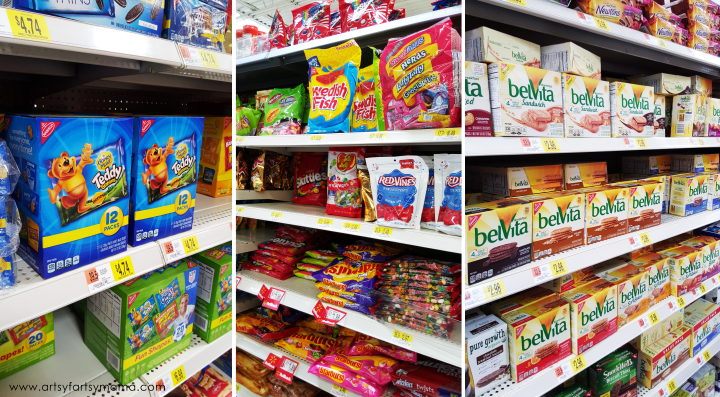 All the snacks we purchased (and more) can be found at Walmart. Make sure you look for the coupon booklets (which includes coupons for RITZ Cracker Sandwiches, BELVITA Sandwich Breakfast Biscuits, SWEDISH FISH Soft & Chewy Candy 1.9 lb. 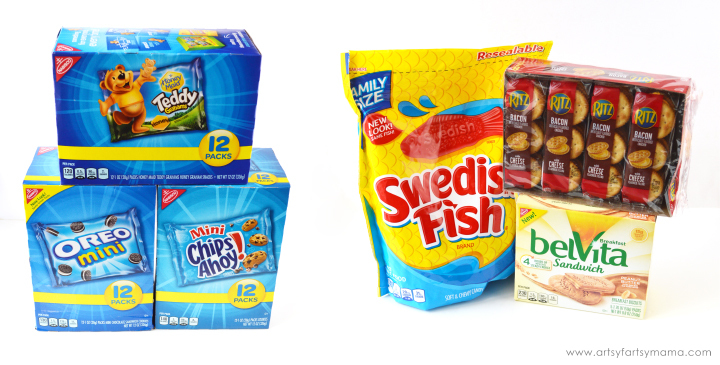 bags and TRIDENT Unwrapped Gum) to save more on your favorite snacks. While we're talking about snacks, don't forget to enter the Mondelēz Summer Road Trip Sweeps to win road trip weekly prizes and a grand prize! Sweepstakes is from 6/27 to 7/24. 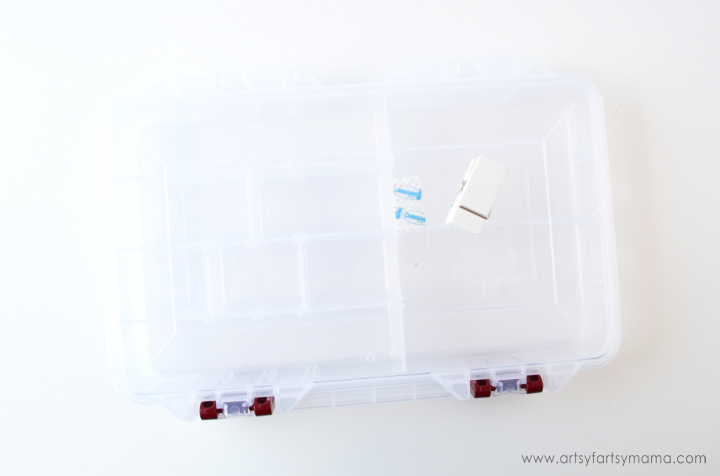 This particular container comes with extra plastic pieces so that you can customize the size and shape of each compartment. I made a space for each of the eight different kinds of snacks we had, with one extra space for SWEDISH FISH Soft & Chewy Candy. I also made sure to leave a larger space to put pens/pencils/crayons. Keep your plans flexible. By all means have a plan. Just keep in mind that anything can happen, so don't be too strict on your schedule. Things like busy traffic, unexpected car problems, weather, and extra bathroom breaks (especially with younger kids) can add some extra hiccups to an already busy schedule. Bring different music options. Sometimes you just can't get radio reception, and listening to the same CDs over and over can make a long drive even longer. Bring some different music or even audio books to change things up and keep the drive interesting. Take a break. Stop and get those wiggles out. Finding interesting places to stop for breaks (historic sites, museums, parks) and also beautiful places for picnics (state parks, lakes, waterfalls) is better than any rest stop and will add some great memories! My biggest tip for traveling with kids is to bring things to keep them entertained. 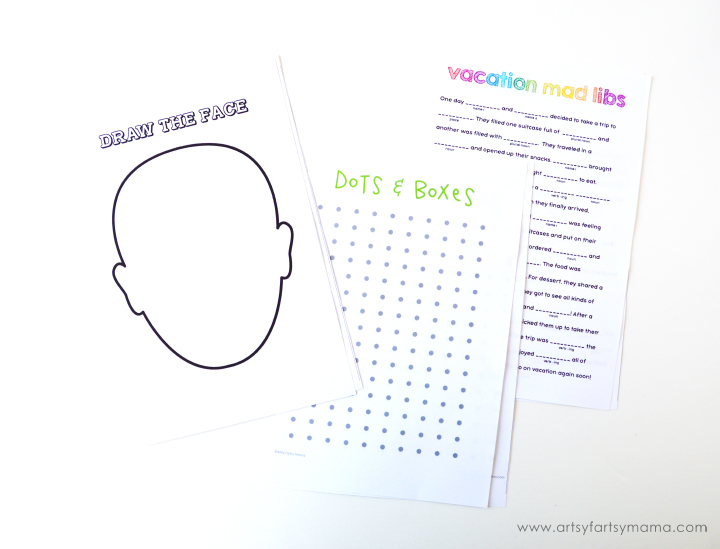 I designed some fun activities like vacation mad libs, a dots and boxes game, and a blank face to get creative with! Click the link below to download and print all three printables. 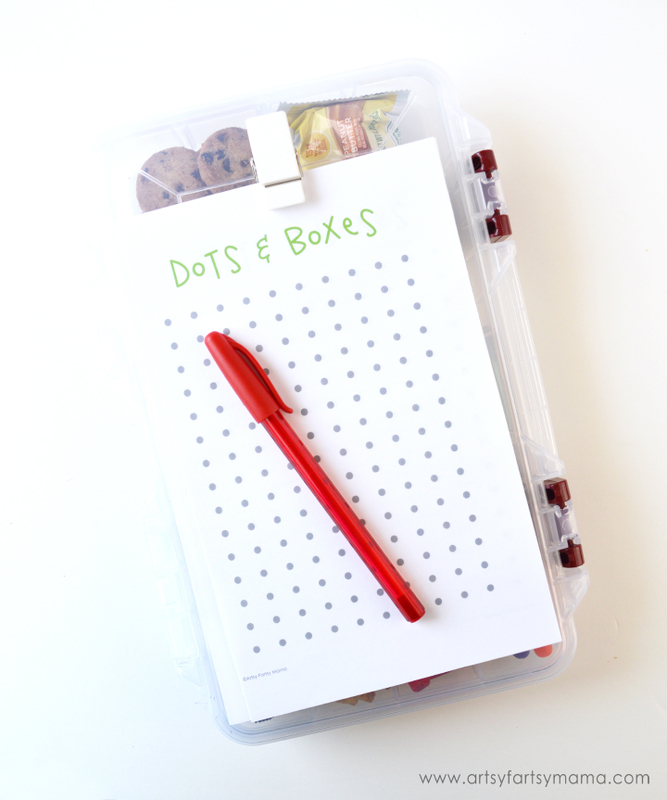 If you're looking for even more travel fun this Road Trip Binder is full of fun ideas. These Road Trip Ideas & Games with more printable road trip games & tutorials will also be a lot of fun for kids. Wondering why I added the clip to the top of the Travel Snack Box? Once you print the activities, cut the pages in half and clip them on. Now you can keep the papers secure with a hard surface to write and color on! What are your favorite travel snacks? Have any great tips for traveling on the road? Share your thoughts in the comments below! What a great idea and so much fun! My grandkiddos will love this. 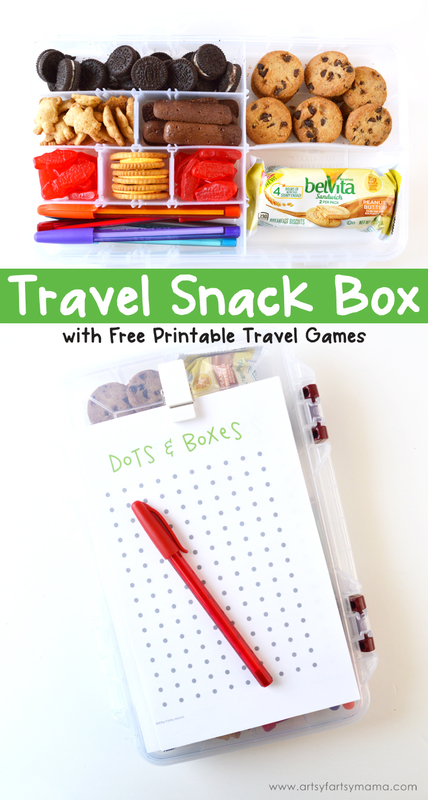 This is super fun - love the printables and snack ideas!! !